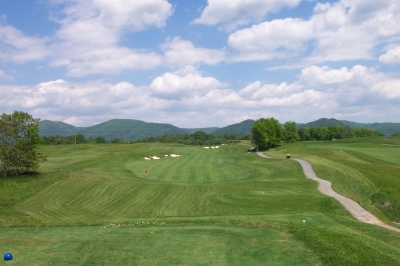 BUENA VISTA, VA � �We believe people will travel an hour to play affordable golf,� remarked the Vista Links� Head Golf Professional, Edward Armentrout. 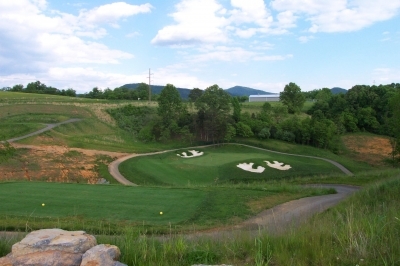 In covering golf in the Mid-Atlantic region, there�ve been many occasions to proclaim �if you build it, they will come,� but there�s no better example of the �Field of Dreams� ghostly optimistic forecast than this new Rick Jacobson design in Buena Vista, Virginia (just to the southeast of Lexington in the Shenandoah Valley). 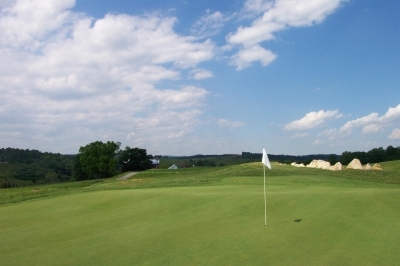 The Vista Links opened in August of 2004, the product of over five years� worth of planning and construction. The Vista Links' 1st hole previews what's to come -- wide hitting areas and beautiful views. Jacobson particularly credits City Manager Scott Dadson and Mayor Harold Kidd for their steadfast determination to bring the project to fruition. �It was an honor to work with the folks from the City of Buena Vista and our construction contractor, Wadsworth Construction � it was a real team effort to create the spectacular end product that is the Vista Links, and we�re extremely pleased with how it ended up,� Jacobson said. Nearing the end, the par three 17th hole plays more difficult than it looks -- mainly because you're shooting uphill from the tee, making club selection quite a challenge. As well they should be. Drama�s the word from the moment you drive onto the property, passing a couple holes along the way � and noticing the incredible variation in the rolling land and what hardly needs mentioning, the extraordinary mountain scenery all around. 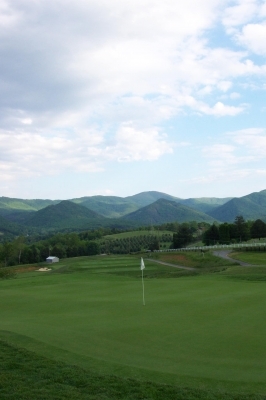 The Vista Links really is golf in a heavenly Virginia environment � no wonder Robert E. Lee chose this area as his permanent home after the Civil War. For all its beauty and quality in the routing, there are still a few blemishes that need to heal at Vista. The playing surfaces are still very much in their growing-in phases. Where a few regional courses (with big budgets) have been completely sodded prior to opening, monetary concerns forced the Vista Links� keepers to try and grow it themselves � and they�ve still got a ways to go. As long as you keep that in mind, it won�t detract from the enjoyment you�ll get just from teeing it up in such a beautiful place. It was also somewhat of an adventure figuring out yardage to the greens and pins, because the sprinkler heads weren�t marked, and the yardage �disks� in the middle of the fairways were often covered up. It felt a little like golf the �old� way where you had to decide on the shot you wanted to hit, and then rely on common experience to send it to its intended destination. The Vista Links' 'signature' hole, the par four 4th. Doesn't look like there's much landing area down there, but trust the architect and let fly. Armentrout assured us that these issues will be dealt with in the near term, as they�re not only working on the conditioning problems, but also on some of the �little� things that golfers come to expect � from service down to the above mentioned yardage markers. �We�re still a baby, but we�re making progress each and every day,� Armentrout said. As mentioned above, the Vista Links project was five years in the making, and required every ounce of its makers� respective talents to get through it all. From behind the par four 15th hole. Almost looks like the hole was there naturally. The result being a layout that appears like it required a huge chunk of change to build, but really was fairly reasonable for what you get in the end. Part of the �expensive� look is the Vista Links� signature bunkers. They�re big, they�re bold, and they�re prevalent. The 5th hole is probably Vista's most intimidating par three, playing 186 yards from the back tees to a green that looks like it's perched on a ledge. And a bit scary, perhaps? Nah. There�s more. �The taller grasses planted around the top sides serves two purposes � one, to eliminate the need to mow steep slopes, and two, to visually tie the interior of the course into the surrounding native grasses. It�s a �links� look� in the mountains, which isn�t easy to achieve,� Myslinski added. Slightly less intimidating but no less well-placed, the par three 13th hole. Just a short-iron down the hill to a big green. But don't get in those bunkers! A couple more accents bring the �links� look to Buena Vista. In most of the playing areas there aren�t many trees � which in the United States, when you build a golf course without a lot of trees, people automatically think �links-style� (even if it�s not). Armentrout said the land was previously used for cattle ranching and farming, so it was cleared long ago. There wasn�t much choice on what to focus on � the wispy native grasses, pasture and rock outcroppings. All of this, and it�s very difficult to remember that this is a �muni� golf course. Somehow, if there were more publicly owned facilities like the Vista Links, the �muni� term would lose some of its negative connotations. Long and wide, the par four 9th invites you to blast it with the driver and run it in just before break time. But for most folks, the five sets of tees will pare down the difficulty to an appropriate level. The fairways and playing areas are more than generous, the visibility of the required shots is exactly what you�d like, and those big greens, though sometimes a challenge to putt, are nonetheless easy to reach. It�s a fun course, and I can see where Armentrout figures people will be willing to drive a bit to get there. A three-shot par five, the 12th hole will require distance and accuracy to earn you a birdie opportunity. 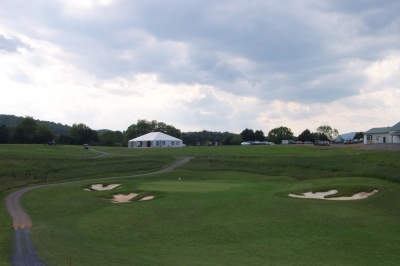 Hole highlights include two consecutive links on the front nine, holes three and four. 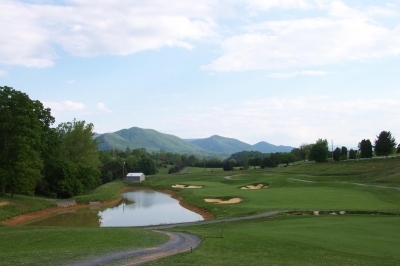 Armentrout says they named the third hole �Dinky,� after an old train that ran in the mountains around these parts � and true to its name, it�s a short par three (148 yards). It may be �dinky,� but it�s not a pushover, as it�s perched on top of an exposed ridge, and the green is especially tricky, even for those who manage to find it on their tee shots. Four�s the one you�ll see on all the postcards. 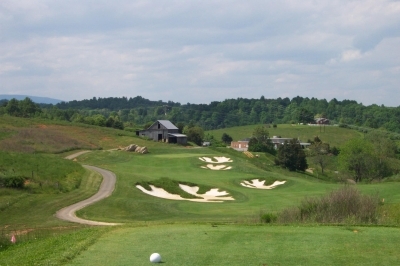 Called �Old Barn,� it�s a risk-reward par four (334 yards) that plays downhill off the tee, then slightly uphill on the approach � with the backdrop being an old barn. 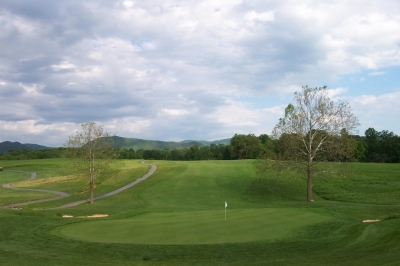 Here�s one view straight out of the classics � vintage Virginia, all the way � and a difficult, sloping green to challenge you to make a score, too. The sixteenth hole is another risk-reward gem, this time a par five, requiring length and accuracy on all shots. 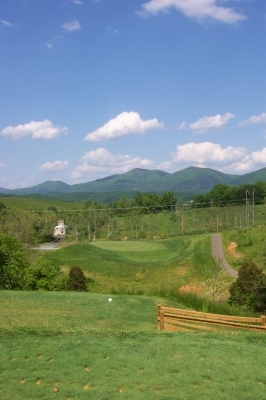 What a marvelous view from the tee, as it plays somewhat downhill with the mountains in the background � and a pond nearer the green. The second shot is especially tricky. For those who hit a big drive, you can try for the green � for the rest of us, it�s a lay-up to the right of the pond and avoiding two of those monster bunkers to provide good position for a wedge shot in. Though it only measures 370 yards, the par four 14th hole is probably the Vista Links' scariest tee shot. Luckily, you won't really need driver here. The final hole is one you�d expect from a designer who tutored under Jack Nicklaus � a long par four (467 yards) that�ll settle the match. As is true with virtually every hole, there�s plenty of room off the tee, but the second shot�s a mid-to-long iron to a well protected, large green. One would think that with the quality of the product, Armentrout�s right � and it�s not such a leap of faith to think people will drive an hour to find affordable, upscale golf. 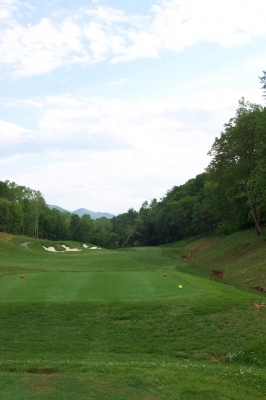 'Dinky' in name only, the par three 3rd hole offers a big sloped green and rock outcroppings accenting the golf hole. While Edward Armentrout bets people will drive an hour to find high quality affordable golf, the Vista Links was a bit more than that for us � we needed a place to stay overnight. 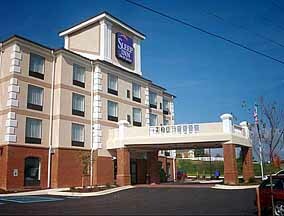 We chose the new Sleep Inn & Suites (By Choice Hotels) in nearby Lexington. We�re always looking for affordable accommodations that are a step above your basic motel, and also convenient to the Interstate and local restaurants and attractions � the Sleep Inn was a perfect choice. Our favorite par five, the 16th hole's second shot is one that'll test your shot-making abilities. 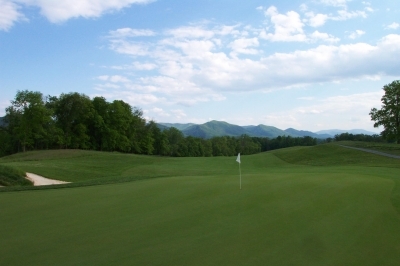 After a round at the Vista Links, drive a couple miles and put your feet up at the Sleep Inn Lexington. $32 during the week, including the cart, and $39 on the weekends including the cart. These are introductory rates, good for the 2005 season. Armentrout says he doesn�t look for them to grow exponentially in the next year or so.